It’s that time of year again! Time to let loose and eat whatever we want for the Holidays! Well, not so much. Having a disability sometimes makes it difficult to maintain your weight with cardiovascular exercise. Because of this, it’s super important to watch everything that goes into your mouth! This is especially important during the holiday season when we seem to through all discretion out the window when it comes to our eating habits. It’s great to spend time with family and friends over a wonderful meal, but for most people, this is the time of year that the most weight gain occurs. 1. Use a Smaller Plate – First of all, you’ll feel like a giant with a small plate in your hand! How cool is that?! But really, even if you go back for seconds, using this method will actually help you eat less. 2. Skip the Appetizers – It’s so tempting to just start munching as soon as you arrive. If you must, then go for the veggies or some nuts. 3. Eat Slowly and Focus – It’s easy to get lost in conversation and just shovel food down your gullet, and before you know it, you’re stuffed and feeling horrible. If you take your time and really THINK about what you’re eating, your body will tell you when it’s full and you’ll find that you won’t eat as much. And, more than likely, you’ll actually have some room for dessert! 4. BONUS! – Speaking of dessert… skip the whip cream! You’ll cut a bunch of calories! With all of this said, have a HAPPY HOLIDAY SEASON and ENJOY yourself! If you end up going nuts on the food side, put in the extra work at the gym or when you get to exercise! 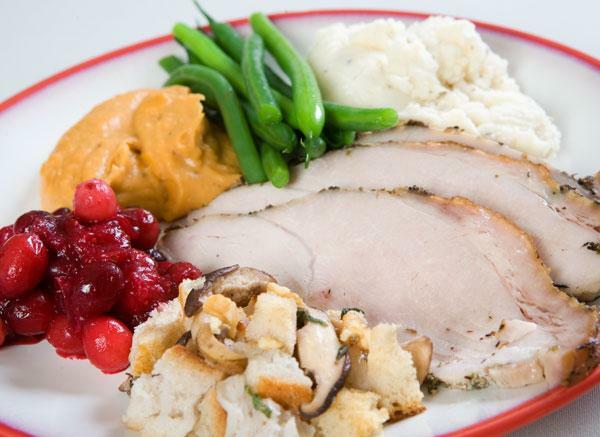 What are some things you do to keep it healthy during holiday meals? Post your comments below.